Walking by, you notice several signs that Dai Family Qionglai Style Soup Noodles (代氏邛崃清汤面) is a good place to eat: people of various ages and professions fill the tables; another storefront on the same street has been taken over as an overflow dining room; an unrelated restaurant has opened up nearby serving the same type of food. (This last trick is really annoying; I often see the newcomer first and end up going into the wrong restaurant.) This type of success with this simple of a menu must mean they are doing something very right. Plain broth soup noodles (清汤面), the house specialty, in a very generous one liang serving. Chicken pieces on top, surprisingly not bony. The broth was really amazing and fresh tasting. A new favourite, and really makes me want to visit Qionglai. They were charging Y2 for a bowl of cabbage, which I thought was a major gouge. When I got the vegetable, I understood. It's a good sized serving, floating in the same amazing soup. I wanted to sample a spicy dish here so asked for a one liang serving of su jiao noodles (素椒面). (Really don't get the name - 'plain pepper noodles'?) This is a standard dry mixed noodle with oil and seasonings on the bottom and meat on the top, and was spicy enough to make me break a sweat. The really neat thing was that the meat mixture had some crunch, even after being stirred up. Outside the west first section of the second ring. Sugar laced rings of deep fried dough are something many foreigners sorely miss while living in China, and Dico's was the last place I expected to offer them. 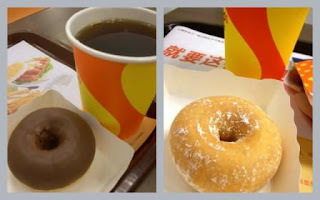 Their ' duonazi' (多纳滋), very small cake style doughnuts, have been available for the past couple of weeks. The plain ones are not too bad, but the chocolate covered ones use the sad trick of colouring some substance brown and calling it 'chocolate' - there's very little actual chocolate flavour. Most Chengdu 糖油果子 (fried sticky rice balls with sesame) taste much better. "This is called bing fenr", said the mother to her little girl beside me, who was spooning up a bowl of sweet jelly and syrup. We were on Shuwa Street downtown, inside a narrow shop that sells various varieties of cool summer snacks. I was glad of the mother's reminder since I have a tough time keeping the names straight. Hakka style liang fen, or cool bean starch noodles, are called 伤心凉粉 shāngxīn liángfĕn, meaning 'sad noodles'. It makes for some interesting Chinglish on shop signs. The place is always very busy. You are almost guaranteed to be sharing a table with someone. I am looking forward to going back for their 凉面 liángmiàn - wheat noodles tossed with seasonings, very hot; and for the 凉糕 liánggāo - smooth, cool rice flour based pudding, also doused in syrup. It's a good place to come for a treat after eating chuan chuan. Most snacks are Y3-Y5. Address: South Shuwa Street #34 (暑袜南街34号) Shuwa street is between Tianfu Square and Chunxi Road. Shuwa Street is a narrow strip between Tianfu Square and Chunxi Road downtown. I used to love coming here because the alleys were full of street vendors. The street vendors are gone but there are now five or six little stores on the south section selling chuan chuan ( 串串). Chuan Chuan is related to hot pot, but everything is on a skewer and the broth is always the same - numbing and spicy red. You pick out what you want and the servers cook it for you in one common pot. When you are finished they count up the number of skewers and you pay according to what you ate. The server mixed up a you die - sesame oil, more hot pepper, green onions, a little garlic, and some msg. I got a cooling bowl of congee (稀饭) to eat with it. You can see the skewers piled up behind the tray. South Shuwa Street, I think it is #54. (暑袜南街 54 号) One of several chuan chuan places on the same block. The restaurant floor of Isetan department store is an air conditioned haven from the heat and crowds of Chun Xi road on a summer weekend. There is a Thai place, a Japanese buffet, a cha can ting (surprise), and a tonkatsu place. I walked to each restaurant looking at menus and chatting with the host staff before picking Tonkatsu Wako, which specializes in Japanese breaded fried pork cutlets in a variety of preparations. The menu here, with its set meals and snacks, is very suited to the solo diner and shopper. The panko breaded pork cutlet had decent flavour but was quite thick (not pounded/tenderized) and should have been fried a little hotter; it was greasy. The accompanying pile of cabbage was fresh and crunchy, but a little too wet. The miso soup had a lot of tiny clams at the bottom, which was a treat. There was a little dish of tonkatsu sauce and mustard to mix in for heat and some curious Japanese pickles. The food here is good and is a nice change of pace from regular Sichuanese food but doesn't meet the standards of the service and decor. This is the oldest and best known vegetarian restaurant in Chengdu. The menu is very unique; each dish has both name and description translated into English. The description gives more detail on the ingredients and focuses on the meat substitutes. It's a pretty interesting document for those who are interested in Chinese vegetarian cooking. Most tables are occupied over lunch and the servers work hard to run orders and clear tables. At times diners need to be pretty assertive to get their attention. We asked for the Sichuan Monkey Head mushrooms, which were very good. The large, round, fuzzy mushrooms had a great texture and the cilantro and garlic were a familiar complement to the numbing and spicy red oil. (I am too much of a laowai to understand why you would cook mushrooms in spice that overwhelms their flavour though.) This generous bowl turned the heads of other customers as it approached our table. The interior is airy and light, and there is some outdoor seating as well. However, the dining room has a used tableware station where they have bus pans for dumping leftovers. It's a little off-putting if you happen to be sitting at one of the tables nearby. Location: inside Wenshu Temple courtyard (need to pay the Y5 to get in). Their tofu salad is cool, smooth, and refreshing. It is also one of the least expensive items on the menu, though didn't come with the tuna flakes as pictured. The seaweed salad had great flavours, a little sweet and tangy with some nutty sesame seeds and hot peppers. This plate of yellow croaker chunks made me wish for a bun to stuff with the fried fish, cabbage, and mayonnaise. It would have made a perfect sandwich. South of the second ring near the Great World Carrefour there are a few blocks where there seem to be more Cantonese than Sichuanese restaurants. There is higher end Cantonese, dim sum and a few of the Hong Kong style cafes (or cha can ting, 茶餐厅) that serve diner style English/Cantonese fusion. However, this far from Hong Kong the formula goes a little off and a 'cha can ting' is just as likely to be an upscale Cantonese or seafood restaurant, or a high end teahouse that serves non-local snacks. The coffee was a treat, just the right sweetness, and the wonton noodles were very good though not quite the standard you'd expect in Hong Kong. I saw a couple plates of fluffy shrimp scrambled eggs (滑蛋虾仁) float by and a few orders of beef hor fun (牛肉何粉), both things I want to try when I return. I also really want to go back for their breakfast. These noodles usually have dried red pepper flakes in the topping and are much spicier than other styles of dry mixed noodles. This version was on the mild side, but was very good. The two liang serving was very generous. I would order one liang next time. Eat in customers are served a bowl of cooking water to drink. I've received plain noodle water at this place before, but this time I ended up with a weak tomato broth which was the most perfect thing to drink with the rich and spicy noodles. I also love the tomato egg noodles (蕃茄鸡蛋面) here; they cook the egg to order so you get it crackling hot. They do quite a bit of takeout and delivery business. The yuxiang shredded pork fried rice (鱼香肉丝炒饭） I had delivered one night tasted great, had a very good stuff/rice ratio and wasn't greasy at all. The western part of Chengdu has a new option for people who want a western style toilet available where they eat - our third Peter's Tex-Mex. This one is on the second floor of a huge shopping complex anchored by a newly opened Ren Ren Le, opposite the south gate of SWUFE. It is smaller and more intimate than the other two Peter's, and the service feels much better here than at the Peter's on Kehua North Road. They have the same great half-off dessert deal after eight p.m. As we left, around nine thirty, quite a few people were coming in for dessert and coffee. The food at Peter's is usually decent, though they definitely have off days and portions can seem tiny to those used to American-style servings. The best sections of the menu are the Tex-Mex dinners, appetizers, and sandwiches. (Always pay the extra for waffle fries.) The entree section, where you get a main with a choice of three sides, is both higher priced and lower quality than the previous and very skippable. (Y65 for meatloaf? Pass, thanks.) They serve breakfast all day. Desserts are on par with a good diner and taste just, well, real. Foreign friends who live in smaller cities beg to eat here when they visit Chengdu, not because it is so delicious but because it is so not Chinese. Location: 彼得西餐 光华村南街 50号 新光华广场二楼 Few minutes' walk outside the west second ring on the next street north of Carrefour.